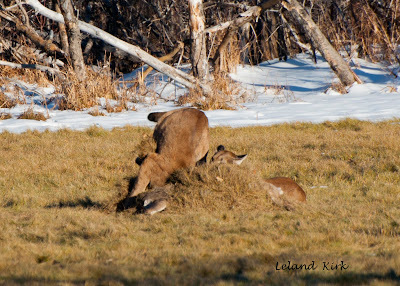 Leland Kirk was out enjoying a photography outing with his twin brother Lochlan in Waterton Park on November 15, 2012. Both men are retired, experienced hunters, and photography buffs. They were looking for mule deer to photograph. "I had met my brother at the park entrance, and we had gone for a bit of walk when we were down there. 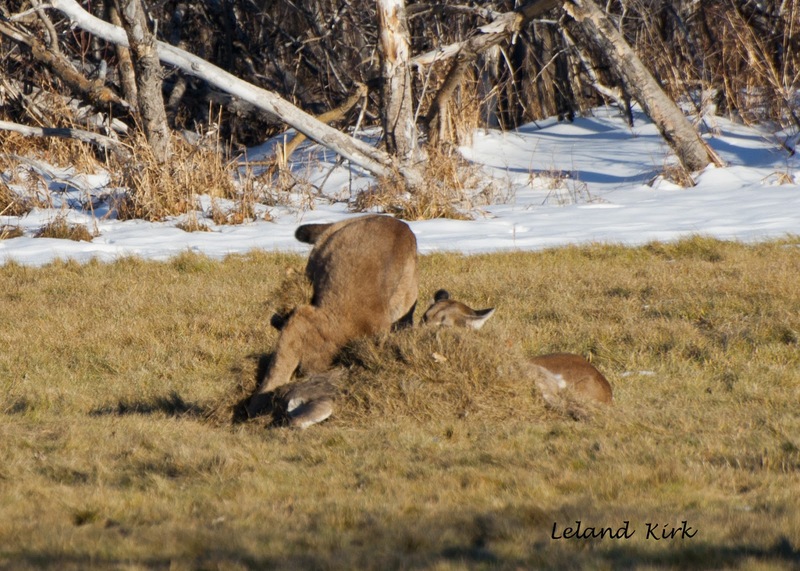 We could see the elk out by the horse barn," said Leland. The two brothers took a few pictures of bucks and had returned to the car. 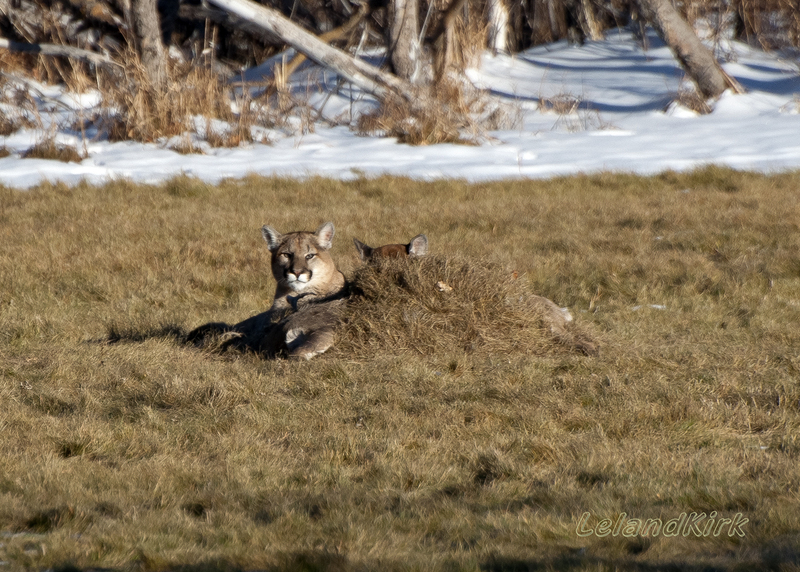 "We were just driving by, and we could see where the cougar had buried a deer. 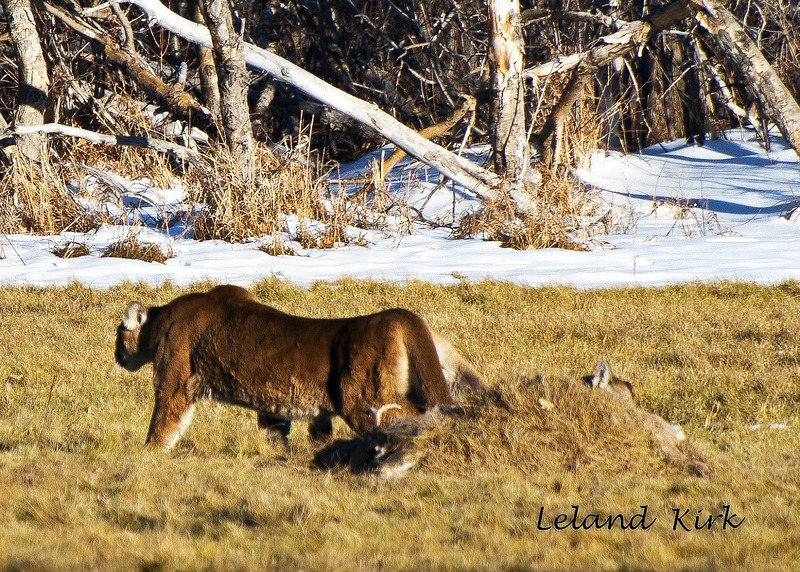 It was all covered with grass, and we could see where the cougar had gone back into the bush," Leland explained. 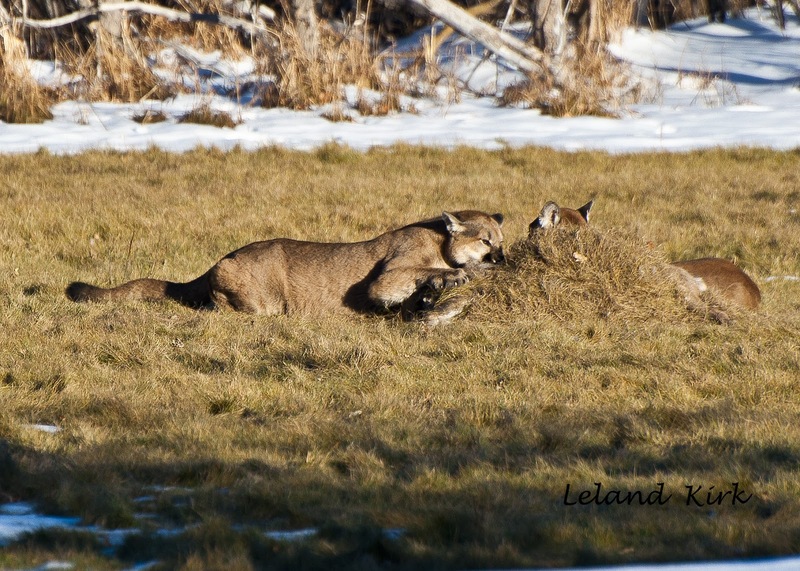 According to Leland he and Lochlan found a good place to park a good distance away to sit and watch the site from inside the safety of the vehicle, hoping for the chance to see the cougar come back. After a period of about one hour, Lochlan had to leave due to other commitments. Leland came back and waited once again. The presence of the car and equipment probably made the cougar more wary of the area. 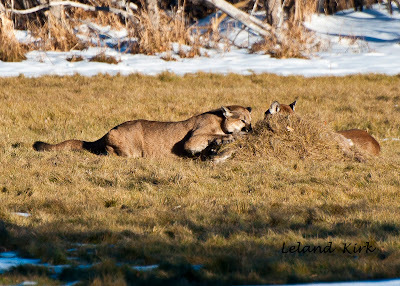 After dozing off, Leland woke up and saw the cougar. He rolled down the window to take a photograph. "Just rolling the window down had the cougar get up and walk off into the bush," he said. Patiently he left the window down enough to take photos and settled in, once again dozing off. 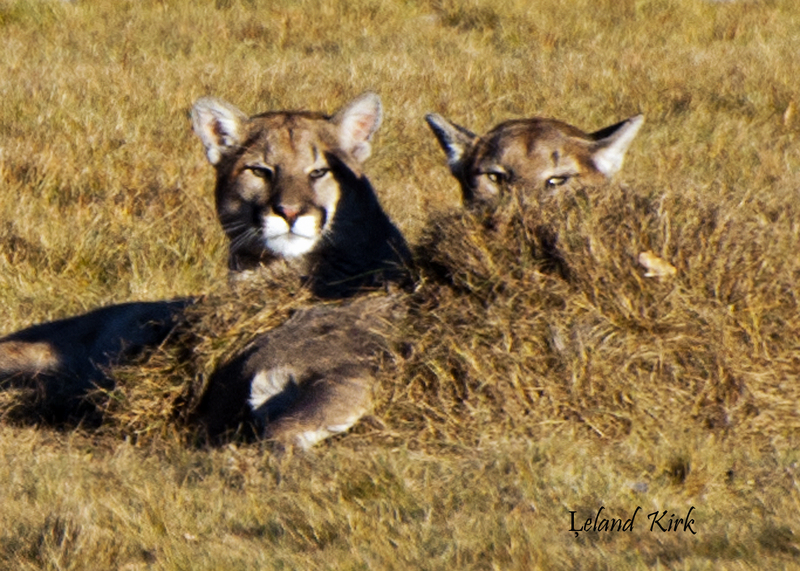 "When I looked up, there were two cougars. What was really nice is that they were completely relaxed. When I started clicking with the camera, I didn't realize at first that they were mother and a kitten. 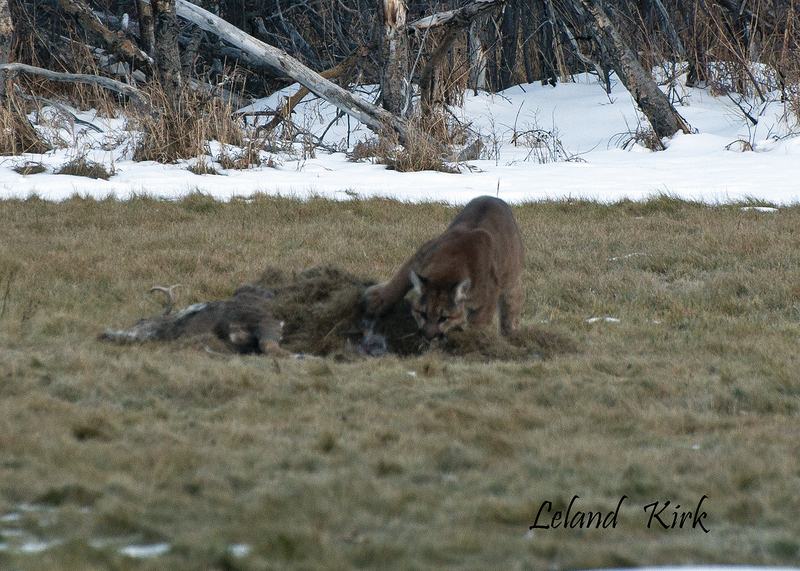 I could see a little bit of spots, and got pictures of the kitten playing with the carcass." "I watched them for a couple hours. Eventually the cougar ended up in the shadow of the park, and that was when it buried it (the carcass) in the grass, and walked away. They are very cautious. I was really lucky to be able to see the behaviour, to see the mother feeding, with the kitten, it was extremely special. I think that the whole key was patience, waiting and not moving. They are very private animals." Ahh the benefits of a nap. This was amazing and thanks for sharing. Awesome pictures, they are one of my very favorite animals, thanks for sharing. Great shots Leland! You were definitely in the right place at the right time.